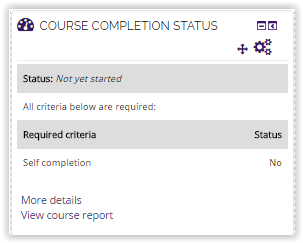 If an instructor has assigned Activity Completion requirements for every activity, and set the requirements for Course Completion, they can add the Course Completion Status block. This block allows students to view their completion progress for the course and instructors can see an overview of the class' completion. For more information on Activity Completion, see GROK article Moodle 3: Activities & Resources: Activity Completion Settings. For more information on setting the Course Completion requirements, see GROK article Moodle 3: Administration: Edit Course Completion Settings. *NOTE: You will need to do these steps if you do not see the Course Completion Status block on your Moodle page. 1. Log into Moodle and click Edit at the top right of the page to turn editing On. 2. 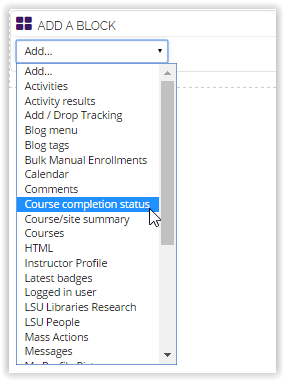 Select Course Completion Status in the Add a Block dropdown box. 3. Students can click on the More details link at the bottom of this block to see the status of each activity and their progress towards course completion. 4. Instructors can click on View course report to see the overview of activities and completion status per student. 1. Log into Moodle and click Edit to turn editing On. 2. Locate the Course Completion block and click the Actions button (gear shaped icon). Select Delete Course Completion Status block from the dropdown menu.